Happy New Year, everybody!! Hope you've got your new year's resolutions in order. But to be honest, mine have never lasted past January. Since I'm not in any way a professional artist, I don't have a dedicated studio space. I have a Pinterest board for one (check it out! ), though!! I have so many dreams of a studio space, entirely dedicated to my art but they aren't reality just yet. So for this post, let me take you through the reality of my "studio". So this is the set of drawers most of my supplies fit into. Ill take you into it but before that, a short disclaimer: most of this revolves around acrylic paint as thats my primary medium and some of my supplies are not currently in this (they're in a different city which doesnt help when you need them). My pencils and drawing tablet sit on top of it. 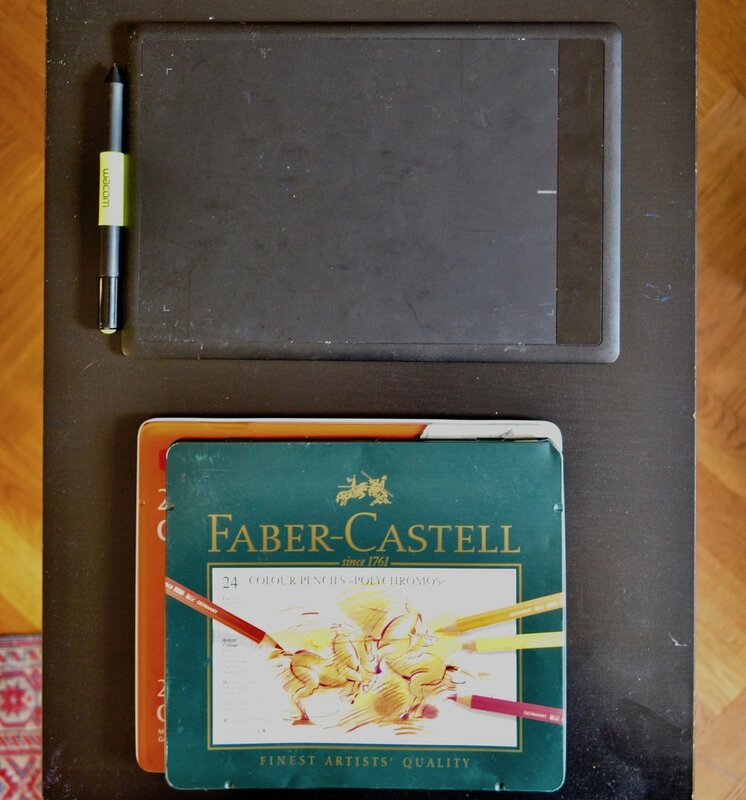 I dont own too many pencils; the top box are my faber-castell color pencils and the bottom box is a mixture of sketching pencils (8H - 8B) and charcoal pencils. This drawer contains my brushes, paint pens, ink pads and my metal palette knives. It's essentially my primary tool drawer. I got the dividers at a kitchen/houshold supplies store. Ok, this drawer is a little bit of a mess. It contains my plastic palette knives (they're bigger), smaller pots of paints (lots of strange colors), ink, tiny trial canvases, stands (to hold up wet work), a pot of Gouache (bottom left) and my business card making supplies. Yeah, its definitely a huge mess. Finally, the last drawer which is meant to be a filing drawer but it really is perfect to store paint bottles and tubes. It also holds my flow aid and pouring mediums. So, this a very incomplete post as it does not include the rest of my dry mediums, fixative sprays tc etc. But I hope you enjoyed this peek into my "organization".